This international, interdisciplinary conference is the final event of the AHRC funded African-Caribbean Women’s Post-Diaspora Network. This research network was established to propose new ways of thinking about diaspora in contemporary African-Caribbean contexts. In seminars and workshops we tested the effectiveness of post-diaspora as a concept that might be used to re-imagine new means by which Caribbean women’s experiences of migration are transformed in twenty-first century contexts of globalisation. Contributors examine the political, imaginative, effective and economic affiliations that challenge the proscriptions of the nation-state, and the social and cultural boundaries used to define gender norms and identities. 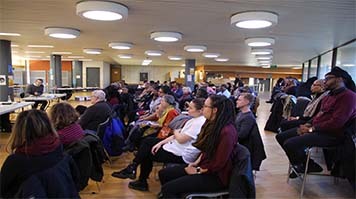 This conference includes papers on visual representations of migration, diaspora and African-Caribbean women’s interconnected cultures, auto-ethnographic accounts and interrogations, literary representations including readings by award-winning authors Diana Evans and Alecia McKenzie, and sociocultural and anthropological analysis of the conference themes. The discussion will provide a timely intervention into contemporary debates in the UK about immigration, and in particular the hostile treatment of the so-called Windrush Generation and their descendants. Diana Evans author of the prize-winning novel 26a, The Wonder and Ordinary People. Alecia McKenzie, author of the short story collections Satellite City, Stories from Yard and the prize-winning novel Sweetheart. Dr Jan Etienne, Birkbeck College, University of London. Dr Gina Athena Ulysse, Wesleyan College, CT, USA. Desrie Thomson-George, visual artist and co-founder of the publishing company Black Ink. Download the event programme (PDF File 221 KB). Desrie Thomson-George, is a UK based visual artist, the Chair of Black Ink Legacy and Co-Founder of Black Ink Collective (1978-1987), the independent publishers which provided a platform for young Black Britons to write and be published. She has designed and produced children's books and illustrations and created magazines including No Limits for girls (1997) and the first national Black History Month magazine - BHM Magazine (1999). Her presentation (Thursday 12th July at 5pm) will focus on the inspiration and motivation for her work, specifically her recent exhibition at the Art Academy, entitled 'Liberated' about Jilo - a Black woman living in the West - the narration of her struggles and her journey.